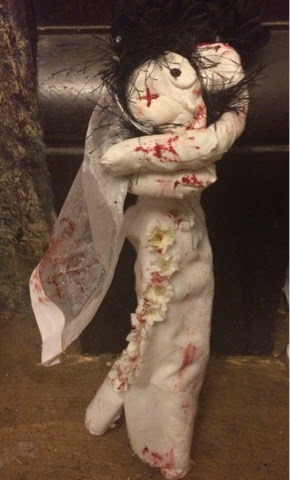 Confessions of an ADD English Teacher: 2014 Zombie doll! This is the third year I've participated in a zombie doll swap. It is so much fun to create creepy dolls and get equally creepy things in the mail. Creating the dolls has always been a challenge for me. The last two years I've purchased doll forms. This year, however, I decided to try my hand at crafting my own doll body and head. The partner for my swap loves The Corpse Bride and I really couldn't find a long lanky dolly form. To create the body, I used a wire coat hanger, wrapped it in cotton batting then covered that in sticky sports tape. For the head, I used sculpty clay then baked it in the oven. I'm in no way claiming this doll looked anything like The Corpse Bride. I just used her as inspiration. 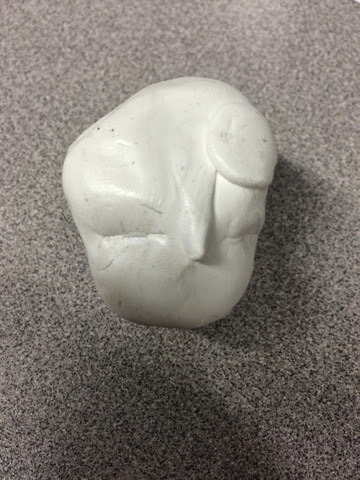 The next big challenge was figuring out how to attach the clay head to the body. The bride was bloodied up using Manic Panic hair dye in "Vamp Red." It seemed appropriate. 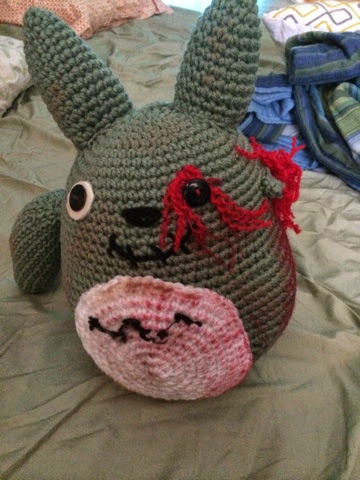 My partner sent me a zombie inspired by my favorite animated movie "My Neighbor Totoro." I LOVE it! The Boy took it to school to show one of his teachers. His friends who know the movie think this stuffy is very, very wrong and disturbing. What a cute idea. I love fun swaps, especially swapping things that are a little different from the norm. This is the best swap idea ever. hahaha, did he tell her that a TEACHER created that very disturbing doll? hahahaha!!!! !